Being a TAP teen has inspired me to more effectively respond to the challenges of teaching. 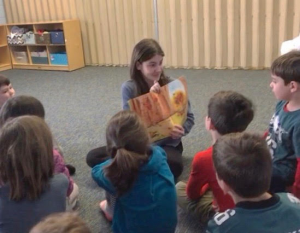 This year is my second year working with a joint class of kindergarten and first graders at Temple Sholom in Broomall. I love working with these kids, as they always have lots of fun and energy in store! While a teacher must control the classroom as a whole, my focus as a madrich are the needs of each individual child. Thanks to the TAP Program, I have learned various techniques for working with children with learning differences. In a younger class, movement, creativity, and patience are key. Kindergartners often begin Sunday school timid and closed-off, however, children who leaned on me as a friend began feeling more comfortable in class. In my classroom, we often emphasize the Hebrew word kavod, meaning respect. Children become more responsive when they trust and respect you. I have found successes in working with these children often come from the special bonds we have formed over time. Sometimes, a child who acts out the most is simply the one who needs a little positive encouragement and support! It is important to remember that every child learns differently. Setbacks including time coming up with more creative approaches and a child’s “off days” may contribute to a moment of understanding. TAP has taught me that we must show students kindness and respect so that each child has the opportunity to learn to the best of their ability. Since starting TAP I have seen an improvement in my teaching skills, and hope to continue learning about how to help kids with learning difficulties in new ways. Creating an engaging Jewish learning experience is an incredibly meaningful opportunity, and I am proud to be a TAP teen!